Stable Cottage01485 544902work Self-cateringStable Cottage forms part of the old stable block serving the Coach House which is set in the grounds of an 18thC manor house, just outside the village of Snettisham. The cottage features exposed beams and comprises of open plan studio accommodation complete with double bed, a small living/dining area, a kitchen and separate shower room. Outside you have parking and a quiet garden with rural views. With its tranquil setting, Stable Cottage is best suited to those who seek peace and quiet, perfect for a relaxing break. A number of footpaths radiate from the area taking you to the village or out over picturesque surrounding countryside. Snettisham itself, with its picturesque village centre, enjoys a good selection of village stores and pubs. It has its own beach set on the RSPB Bird Reserve and thriving Sailing club. 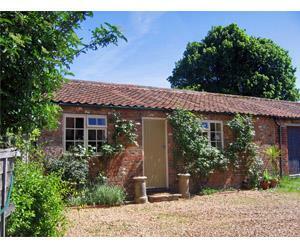 Stable Cottage forms part of the old stable block serving the Coach House which is set in the grounds of an 18thC manor house, just outside the village of Snettisham. The cottage features exposed beams and comprises of open plan studio accommodation complete with double bed, a small living/dining area, a kitchen and separate shower room. Outside you have parking and a quiet garden with rural views. The Royal Sandringham Estate sits barely a 5 minute drive away and the beautiful North Norfolk coast is 10 minutes. Golf course nearby. Ground floor rooms available. Boating and sailing. Electric/gas cooking. Refridgerator. Electric shaver points. Children welcome from any age. Take A149 from King's Lynn to Dersingham village, turn right into Hill Road and left in St Thomas's Lane. Snettisham House signposted on left-hand side. Proceed down drive and turn left and drive under the arch of the clock tower and Stable Cottage is facing you. From Kings Lynn - 10 miles.